TENANT DUTIES Tenant agrees to comply with all obligations imposed by the Vacation Rental Act on the Tenant with respect to maintenance of the Premises, including but not limited to keeping the Premises as clean and safe as the conditions of the Premises permit and causing no unsafe or unsanitary conditions in the common areas and remainder of the Premises that Tenant uses; and notifying Agent in writing of the need of replacement of or repairs to a smoke detector, and replacing the batteries as needed during the tenancy. Tenant agrees not to use the Premises for any activity or purpose that violates any criminal law or governmental regulation. Tenant’s breach of any duty contained in the paragraph shall be considered material, and shall result in the termination of Tenant’s tenancy. DISPUTES This Agreement shall be governed by and interpreted in accordance with the laws of the State of North Carolina, and shall be treated as though it were executed in the County of McDowell, State of North Carolina. Any action relating to this Agreement shall be first handled by mediation at the expense of the party who wishes to mediate. Then, instituted and prosecuted only in the McDowell County Superior Court, North Carolina. Tenant specifically consents to such jurisdiction and to extraterritorial service of process. The Tenant, his/her family, guests and agents shall comply with and abide by all the Agent’s existing and reasonable future rules and regulations, governing the use and occupancy of the premises and any common areas used in connection with them. Any breach of said rules and regulations may be grounds for immediate eviction with no refund of rents. Tenant is subject to the expedited eviction proceedings set forth in N.C.G.S. 42A-23 et seq. A copy of the rules and regulations is contained herein and the tenant acknowledges that he/she has read them by signing this agreement. RENTAL RESERVATION POLICY: Once you make a reservation, we will email you a confirmation. The deposit is non- refundable even should you cancel or not show up. 30% is required at the time the reservation is made and the balance will be charged on the same card 30 days before check in. If the reservation is within 30 days when booking, the entire amount will be charged on the day the reservation is made. Once we receive your payment; driving directions, address and a reservation confirmation will be emailed to you along with check in/check out instructions and a detailed map to the cabin. The person (Guest) making the reservation must be at least 25 years of age. The person (Guest) signing the rental agreement is responsible for all members of their party and will be held accountable for any damages or noncompliance of policies. In no event shall (Guest) assign or sublet the rental property in whole or part. Violations of these rules are grounds for expedited eviction, with no refund. CANCELLATION POLICY: Any changes to your reservations must be made (61 or more) sixty-one or more days before your scheduled arrival date for weekly and nightly rentals at an admin fee of $100. Cancellation policy for weekly and nightly rentals: There are no cancellations, you will forfeit your entire deposits paid should you cancel. “No Shows” will forfeit all rental monies collected and full rent will be charged. You are responsible for the entire balance of the reservation should you decide to cancel, not- show up, not reschedule dates or check out early.. Refunds will NOT be given due to early check-outs, late arrivals, weather, utility outages, and malfunctions of equipment/appliances. Storm Policy/Weather Conditions: No refunds will be given for weather or storms. We recommend 4WD and/or chains in winter months, no refunds due to road conditions, weather or utility outages, as these are out of our control. Please take this seriously and be prepared for bad roads and possible utility outages. Check the weather www.raysweather.com for Spruce Pine, NC. Call the Blue Ridge Parkway Hotline for road closure updates (828) 298 0398. Buy chains, you can always return them if you don’t use them. Travel Insurance: If you wish to purchase travel insurance, go to www.InsureMyTrip.com for details and to purchase. We are not affiliated but recommend this should your trip plans be interrupted as we DO NOT ISSUE REFUNDS after holding your dates for you. We recommend 4WD and/or chains during winter months as the road is not maintained 100% of the time, sometimes we have to wait in line for road maintenance with other roads in the area. Pick up a set of chains at NAPA, Auto Zone, Car Quest for your size tire for about $50, keep in your trunk and if you don’t need them, return them. Again, we do not issue any type of refunds due to weather, road conditions etc. RENTAL POLICIES: NO SMOKING inside the cabin: Evidence of smoking inside, such as smoking odor will result in additional cleaning charge of $150. You may smoke outside on the porches, but you must properly dispose of your cigarette butts. There are sand buckets for butts on the porch. Fires: The guest agrees to not construct any type of fire on the property. We are located in the Pisgah National Forest and fire you will also be fined by the Forest Service, fires are not allowed this is against the law as well as a serious forest fire hazard! Keys: We require the keys be left in the lock box during your entire stay should we have an emergency situation and need to have a plumber, electrician etc enter the cabin for which you would be notified. You are responsible for keys while in your possession. If you lose the keys you will be charged $150.00 to have the locks changed. LEAVE KEYS IN LOCK BOX upon check out after locking the door. Maximum Occupancy: The maximum number of quests is limited to (6) six persons. We provide linens for 4 people, if you plan to use the sleeper sofa, bring linens and pillows for the additional 2 people. PETS: No more than 2 SMALL dogs maximum for a pet fee of $75+ tax. No large dogs.No cats. You are responsible for any damage caused by your pets. Evidence of bringing a pet without paying a pet fee or sneaking in large breed dogs without prior permission will result in a $150 fee to. By clicking AGREE and entering your credit card information you are agreeing to these terms. Cabin is inspected immediately upon departure. WIFI– is run off satellite, we will email you the password. It is only for email and light web browsing and will not stream NetFlix. Service not guaranteed on cell phones or tablets, bring a laptop. Weather can interrupt service, we do not guarantee service. HOT TUB- If you do not agree to these terms, do not use the hot tub. The rules are strict because it’s very expensive to drain/refill and only needs to be done if the hot tub is misused. The hot tub portion of this rental agreement is very specific in order to help prevent any additional charges to your card and for safety reasons. Children under 12 should not use hot tub, period. We rarely have problems unless it is misused and not taken care of. Any bit of URINE in the hot tub will require a drain and refill at a cost to you of $150.00 and the pH will be tested upon check out for urine. No exceptions. Shower before getting in, lotions and body oils, shampoos will make the water cloudy requiring a drain and refill upon your departure at a cost to you of $150 to your card. The water will become cloudy and the filter will not filter out URINE it sends the Alkalinity over the charts. Remind those using the hot tub to not urinate in it or it will be $150.00 charge to drain and refill. Shower before entering hot tub, filter will NOT filter out body oils and lotions. DO NOT LET TEENS PLAY WITH BUTTONS AS TO PROTECT THE CONTROL PANEL FROM ‘FRYING’ IT WILL LOCK THE HOT TUB JETS AND HEATER WHEN BUTTONS ARE PLAYED WITH AND OVERSTIMULATED. WE WILL NOT BE ABLE TO UNLOCK IT DURING YOUR STAY, IT WILL HAVE TO BE SCHEDULED WITH THE HOT TUB COMPANY WHICH IS $150 SERVICE CALL YOU WILL BE CHARGED. THIS IS CRUCIAL AND HAPPENS OFTEN, SO PLEASE DO NOT LET TEENS PLAY WITH BUTTONS AT ALL. It is very simple, if you treat it as you would your own, you will be charged nothing additional upon check out. Use the hot tub at your own risk, owner assumes no liability for optional use of hot tub or for any any allergic reaction to chemicals. Spa chemicals can cause skin irritations. DO NOT URINATE IN HOT TUB OR IT WILL BE CLOUDY AND YOU WILL BE CHARGED $150 upon check out for a drain/refill. The hot tub is clean and clear when you arrive, it should be clean and clear when you leave. The hot tub filter and chlorine will not filter out urine, (remind all guests!) beer, food, mud, dirt and soda etc. and if such things enter the water, it will need to be drained and filled upon your departure which will result in a $150 charge on your card, NO EXCEPTIONS. Do not use the hot tub if you do not agree to these terms. Please shower before going in hot tub. If the hot tub is not as you found it , and must be drained and refilled upon your departure, your credit card will be charged $150.00. No exceptions! No jumping or diving in the hot tub and do not leave anyone unattended. CHECK-IN POLICY: Check in is at 4:00 PM. Maintenance: Please notify us of any maintenance/equipment problems within 1 hour of your arrival. During normal business hours, every effort will be made to resolve the problem as quickly as possible, however we do not issue refunds or credits for equipment failures as they are beyond our control. This rarely happens. Call 919-602-6722. Instructions for the fire place, hot tub and TV are posted in the cabin and sent in the welcome packet email, we do not send maintenance for these minor issues. We have the right to enter the premises for any maintenance related issues during your stay. CHECK-OUT INSTRUCTIONS: We ask our renters to agree to the following check-out instructions. Check out is 10:00 AM. Our check out policy is simple: leave cabin as you found it upon arrival. Take the trash out and empty the dishwasher. Wipe out the fridge and microwave. Put any towels you used in the bath tub downstairs. Leave the sheets on the beds, housekeeping will strip beds. You are paying for basic standard check out cleaning upon your departure which includes general housekeeping, vacuuming and washing of linens. Any undue and/or unreasonable cleaning of the house and yard immediately subsequent to your departure will result in a charge of 75.00 per hour. Wash and dry all dishes, pots and silverware and place in cupboards neatly. Do not rearrange décor. Please make sure all trash is BAGGED and tied and placed in the trash bin outside and a maximum of 3 white kitchen bags. Any additional trash beyond the 3 kitchen bags will result in a trip for maintenance at $75/ flat fee. Your card is kept on file for any incidentals, damages, hot tub charges, extra cleaning or extra trash pick up charges, missing or damaged items. You are agreeing to allow us to charge your card for any of the above. You can take extra trash with you or to the Spruce Pine Landfill, directions in the Welcome Packet provided in your confirmation email. Hold Harmless: Owner does not assume any liability for loss, damage, injury or illness to persons or their personal property while on the premises or as a result of your stay on the premises. Neither do we accept liability for any inconvenience arising from any temporary defects or stoppage in supply of water, gas, electricity or plumbing. Nor will the owners accept liability for any loss or damage caused by weather conditions, natural disasters, acts of God or other reasons beyond our control. Guest(s) understand they are solely responsible for any property damage, accident injury to any person(s) or loss sustained by any person, including lost money, jewelry, and other items of personal property. Guest(s) shall inspect and be familiar with proper use and application of all items of personal property in the home prior using them. Guest(s) hereby agrees to INDEMNIFY and hold homeowner harmless from any and all claims including those of third parties, arising out of or any way related to Guest(s) use of premises of the items in personal property provided therein. Guest(s) assumes the risk of injury or other losses relating to any recreational activities or injuries sustained on the property and will hold owner(s) harmless. By accepting this reservation, it is agreed that all guests are expressly assuming the risk of any harm arising from their use of the premises or others whom they invite to use the premise. 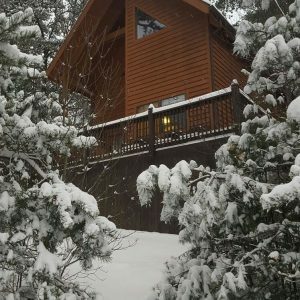 Charges on your card will be show as: BRP Cabin Rentals/ A MOUNTAIN DREAM CABIN Once this reservation is made we do not adjust the nightly rate or give refunds or adjustments due to any advertised specials we may run to get our cabin rented. This is a legal binding agreement for a vacation rental property. Your payment is evidence of your acceptance of ALL of our rental policies and lease. By signing you agree to all of the above pages, terms, conditions and charges listed in this Rental Agreement and all pages. You are also signing and authorizing A Mountain Dream Cabin BRP Cabin Rentals to charge your card after your stay for any and all damages and violations of this rental agreement/ lease, described above, extra cleaning, extra trash and hot tub draining and refilling if necessary. Any violations will result in immediate eviction. Theft of services (sneaking in additional guests, pets) will result in the signer being formally charged with theft of services and we will press charges and prosecute in a Mc Dowell County Court. THE PARTIES ACKNOWLEDGE THAT THEY HAVE READ THIS AGREEMENT, UNDERSTAND IT, AND AGREE TO BE BOUND BY ITS TERMS AND CONDITIONS.